The historic William H. Wells Manor along East Jefferson, located within a two-minute drive of downtown Detroit, has been acquired by Byzantine Holdings. The Detroit-based company is marketing the 18,000-square-foot manor and neighboring 4,500-square-foot carriage house to potential office, foundation, and international tenants. 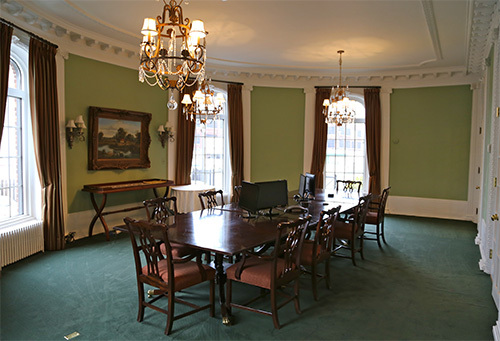 “In addition to a unique office setting, the property would make for a great consulate, especially with all of the international attention focused on Detroit,” says Christos Moisides, partner of Byzantine Holdings with David Sutherland, a partner with the law firm of Wakefield, Sutherland & Lubera, with offices in Troy and St. Clair Shores. 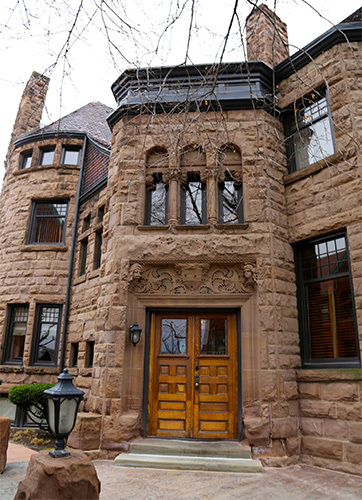 Most recently owned by a logistics firm, Moisides says the Romanesque Revival manor (2931 E. Jefferson), often referred to as Wells Castle, underwent a $1.5-million renovation in 2000. The main home offers four levels of space, a stone turret, private offices, a boardroom, a kitchen, and multiple bathrooms. The home, sheathed in rock-faced stone and topped with a slate roof, was built in 1886. “The property is almost half an acre, it’s a gated campus with 22 parking spots, and the property spans both East Jefferson and Larned Street,” says Moisides, an associate of 400 Monroe Associates in Detroit, which operates numerous enterprises including the Atheneum Suite Hotel, three Fishbone restaurants (Detroit, Southfield, St. Clair Shores), and the London Chop House, LCH Cigar Lounge, and Flat 151 (downtown Detroit), among other properties. For more information about Wells Castle, call 313-309-2414. At right: The main home offers four levels of space and includes private offices and a boardroom.